Planning a porch party for gluten-free guests doesn’t have to be difficult. These simple party planning tips and easy recipes will help you! Party planning can feel tricky when cooking for gluten-free guests, but it doesn’t have to be complicated. I’ve created a gluten-free menu using the new gluten-free spice blends from McCormick for simple, hassle-free entertaining. These recipe mixes are made without gluten, MSG or artificial flavors/colors and they are the same price as their non-gluten-free counterparts. I’m sharing recipes for a Tex-Mex Layered Dip for party snacking, Fiesta Meatballs (think-deconstructed tacos) with Avocado Dipping sauce for a hearty appetizer, and a simple Stir-Fried Beef and Broccoli recipe for dinner. I’m also including tips for planning a porch party stress-free, to enhance your entertaining experience. Living in the south, we love and utilize our porches for relaxing and entertaining family and friends. Even if you don’t have a porch, you can host a fabulous party outdoors, incorporating simple tips and tricks to keep things easy and fun. Flowers add a nice pop of color as a outdoor table centerpiece or buffet accent. You can save money by cutting seasonal flowers from your yard, or even use greenery in vases for an economical and beautiful enhancement to your tables. 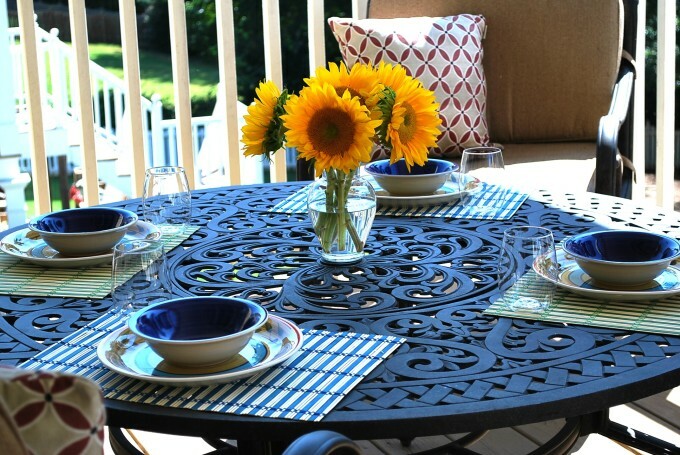 When planning a porch party, don’t forget about ambiance! Mason jars make nice and affordable candle holders. You can find inexpensive candles at your local dollar store to place inside whatever glass jars you have around the house. Citronella candles are great for keeping the bugs away, while adding to the ambiance of the porch. You can also use Mason jars for utensil and condiment holders. You can arrange them on a nice tray, along with plates and napkins for serving. I love to fill buckets or galvanized tubs with ice and a variety of drinks for guests to choose from. Decorative glass or acrylic drink dispensers are great for serving cocktails, like Sangria, or non-alcoholic drinks , like flavored spa waters with herbs and fresh citrus slices. When planning a porch party, the most important part is the food, right?! I’ve prepared a delicious, gluten-free, menu that even your gluten-loving guests will love. This Tex-Mex layered dip is simple to prepare and goes well with your favorite tortilla chips. Refrigerate the cream cheese layer for a couple of hours, then add all your other toppings right before serving. This Fiesta Meatball recipe is a unique twist on a Mexican favorite, with all of the elements of a taco rolled up into a tender and juicy meatball. Even your pickiest eaters will love this appetizer. The taco sauce is optional and you can serve it on the side or drizzle over meatballs before serving. Preheat oven to 350 degrees F. Mix all ingredients together using your hands or with a paddle attachment on a stand mixer until all ingredients are well incorporated. Roll into golf ball size balls. Heat a non-stick skillet on medium-high and add olive oil. Brown meatballs on all sides. Place browned meatballs on a baking sheet sprayed with non-stick spray and finish cooking for 15 minutes. Planning a porch party without planning to make foods like avocado dip? Just say no! Mash avocado with a fork and stir in all other ingredients. Sprinkle with a little extra cilantro before serving. The main course is so easy to make, taking me about 10 minutes to throw together. Best of all, it’s really delicious! I use top sirloin instead of flank steak because it’s economical and tender. It’s my favorite cut of meat to use in quick stir-fry recipes. Mix Gravy mix, water and pepper in a medium bowl. Set aside. Heat oil in a large skillet on med-high heat. Add beef; cook and stir 3 to 4 minutes. Stir in broccoli and gravy mixture. Bring to a boil. Reduce heat to low; cover and simmer 5-8 minutes or until broccoli is tender-crisp. Serve over cooked rice, if desired. I hope these tips and gluten-free recipes will make planning a porch party easier for you! You can find more delicious Gluten-Free recipe creations from McCormick over at Allrecipes.com. « Hillshire Snacking = Protein On-The-Go! Amee, I love a porch party! Do you use your front porch? I’m too introverted to do that! But I have a nice porch off my kitchen and have had a couple of do’s out there. Such a tasty menu, such a pretty setting!